This is a good place to post a bug for help from the forum but if it turns out to be an actual bug you should contact or fill out a ticket at Line6 Customer Support. Your issue sounds like perhaps you should try a global reset and if that does not work try to reflash the firmware. What version of the firmware are you on? Happy 4th to all the American forumites! Yesterday I was importing presets I downloaded. They sounded great, until I went to add a boost footswitch. I assigned the following amp (2204 head) parameters to the "boost" footswitch -- increase in channel volume, increase in mid, decrease in bass. I was using the Helix editor in Windows 10 at assign the parameters to the switch, hitting the "save" button on the editor between each parameter being added. At some point in the process, I lost sound to the preset. I went to a different preset, then came back and still no sound. Next I tried removing the boost footswitch altogether, yet still no sound. I removed the patch, re-imported and added the footswitch manually on the Helix without the editor and it worked fine. Happy 4th to you as well. This is a bug that has been reported by several users. I noticed it and sent extensive reports on every step of the process to have this happen and was able to successfully (if you want to call repeatedly creating the problem a success) create the steps. 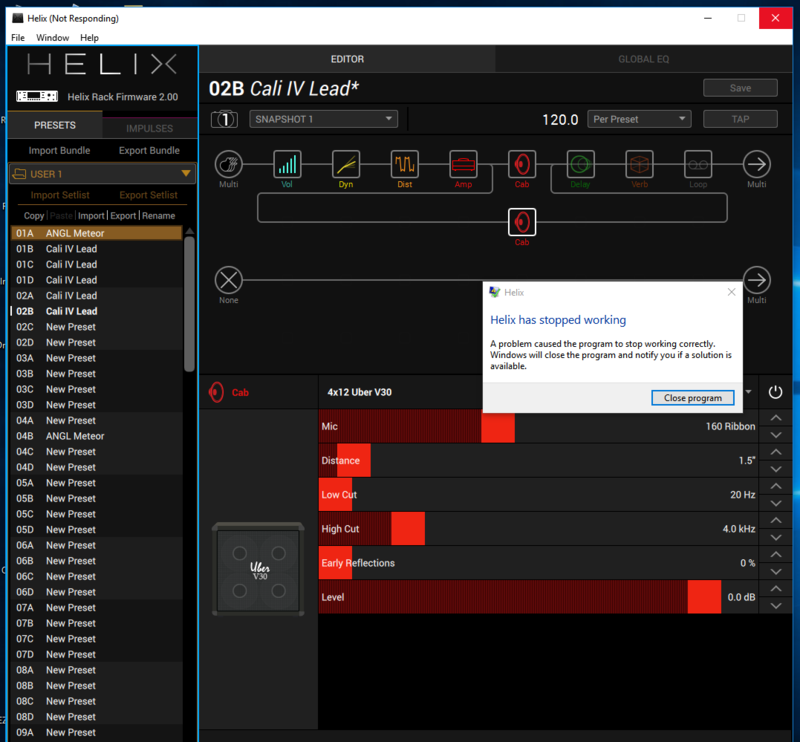 In the final communique from Line 6 support I have been told this bug will be resolved in the next upgrade which "may or may not be out" [just playin' with DI here] by mid if not end of this month. Thanks, Dennis... good to know. Edit: removed due to confirming that it was a problem with my headphones not the Helix. Well, adding a block is something that affects the whole preset, so I'm not sure how it could behave differently. A snapshot is simply saving the states of all the blocks and controlled parameters in a preset. If you add a block to a preset, you have to go into each snapshot and set up that block however you want it in each snapshot. It's how the workflow is with snapshots. I suppose it could be possible that the default state for adding a new block was off in every snapshot, but that's not very intuitive. Phil_m, I am not sure tagmusenmagnus1 has exactly described the issue. Adding a block should add it to all snapshots. I do think there is either something buggy in the way bypass states are interacting with the snapshot discard/retain modes or perhaps I either don't exactly understand the rules governing them yet. Perhaps they have not been fully documented because I could not suss them out a first glance checking the documentation after running some experiments in setting bypass states in the Snapshots. It is not yet clear to me how changing the bypass state in one Snapshot is supposed to interact with the bypass states in the other snapshots, and how this behavior differs between the "Retain" and "Discard" settings. Changing the bypass state of a block in one Snapshot seems to be changing the bypass state in the other Snapshots, not always the preferred behavior. In other words, changing the bypass state for a block changes it for the same block in the other snapshots as well. I thought retain/discard would either allow or disallow that behavior but I may just not understand how it works fully yet. Perhaps we need an additional parameter for bypass state behavior as retain/allow seems to have been targeted at block parameters and previous save state rather than bypass states. I am confused right now. Will play with it a bit more later when I have more time. If anyone has figured out the rules to setting bypass states from snapshot to snapshot please enlighten us. I may just be missing something simple. My understanding is that every preset begins with 8 identical copies of Snapshot1. Any changes (e.g. adding a block, or a block bypass) made in Snapshot1 are immediately reflected in all other snapshots. Moving the focus to Snapshot2 'freezes' Snapshot1, but now Snapshots 2 through 8 are identical with any change in 2 again being reflected in 3 through 8. This pattern continues - with higher numbered Snapshots being copies of the previous changed snapshot number - until/unless all 8 snapshots have been individually changed. For example, if you use/modify only the first four Snapshots in a preset then Snapshots 5 through 8 will continuously reflect any changes made in Snapshot4. This behaviour will continue until/unless you select and modify one of Snapshots 5 through 8. So if you begin with a new preset and add blocks in Snapshot1, then move to Snapshot2 and bypass a block it should not be bypassed in Snapshot1, but it will be bypassed in 3 through 8. That was my observation through beta testing although I have not seen it documented. This is basically what I observed, too, although, you don't have to go through the snapshots in numerical order. When you go into a preset where the snapshots haven't been defined yet, they are all the same, like you said. So I set up Snapshot 1 like I want it, then if I go to Snapshot 4, for instance, the settings there will match Snapshot 1. If I make changes in Snapshot 4, and then go to Snapshot 6, Snapshot 6 will match Snapshot 4. Basically, unedited snapshot will match the last Snapshot you edited. Once you have made changes in them all, they will automatically recall the changes as long as you have the Snapshots Edit parameter set to "Recall" in the Global Settings Menu. Note, though, this sort of workflow described above only applies to presets with "virgin" snapshots - meaning presets in which you haven't edited some or all of the snapshots. If you bring up a preset with 8 saved snapshots, editing in one of them doesn't affect the others (unless you do something that affects the whole preset - like move, add, or delete blocks). Do either of you know if the snapshot feature can just be turned off? I haven't updated yet. Just kind of wondering what snapshot mode will do as a benefit since I really didn't have a need for it before? Can't be turned off, per se, but you could easily ignore it. In fact, by default, when you turn on the Helix after doing the update, it will function pretty much the same as it did before the update (the Global Settings menu has changed). The mode switch will switch between Preset and Stomp mode. If you don't ever want to go to Snapshot mode, you don't have to. It would be very easy to ignore. That being said, I'd really suggest you check them out. It's really easy to use, and they add a ton in the way of flexibility. Thanks for the reply. I'll will check it out when I can. I have a gig Friday but will probably do the update Sunday. More later. Bug Description: Controller Assign screen is not working properly in Editor. Custom naming is not retained properly after a save from the Controller Assign screen in the editor and selecting a custom LED color has no effect. Saving while in this screen will actually cause the custom name and LED color to be lost next time you bring up the preset. Select a preset in the editor where you have already assigned (using the Helix) a footswitch to a parameter with a custom label and LED ring color. Now highlight the customized block and select the "Controller Assign" screen and select the parameter you customized. It will show the custom label you assigned on the Helix but will show the LED ring color as "Off". Additionally the LED ring color selection has no effect at all on the Helix from the editor, You cannot change the LED color from the editor. Save your preset from the editor without leaving the current "Controller Assign" screen and your customized parameter. Switch to another preset and come back to the one you were editing. The custom name you assigned to the block is gone and has reverted back to the default. Your custom LED color is also gone and has reverted back to the default. If some other users can confirm this behavior or let me know if it is pilot error it would be much appreciated. Thanks! I see that i have not been very clear. The thing is that i want to be in "discard" mode. I have made 4 snapshots, that i want to use: Clean, Crunch1, Crunch2 and lead. I dont want any changes to happen in these as want to know exactly what sound comes when i recall snapshot 1. But if i end up i a situation where i want to add an FX-block on the fly. I.e. i could need a chorus. I add in a chorus-block an link a to an empty stomp-switch, so i can turn it on when ever i need it. But now all of the snapshots have this new block turned on even though it was not saved to them. My basic point to line 6 is this: Any new blocks should have their bypass-state set to "off" in the snapshots - as the new blocks have not been saved to them and therefor was not meant to be in them. Two different sets of options listed. 1st should be omitted. Graphic below shows only 1 tuner arrow lit with lower center bar green and top micro-bar yellow. My tuner screen shows both arrows lit once lower center bar is green, regardless of the state of the top bars. That is to say, that when my tuner bars are as pictured below, both arrows are lit. (Page 31) I have floor unit. Any chance that's a floor vs. rack difference? I suppose we could go back and forth all day about what the designed behavior should be, but as it stands now, what you're describing is simply the way it's designed to work. Nothing you're describing is an actual bug (what this thread is reserved for). So I guess my suggestion would be to create and IdeaScale entry for the behavior you'd like to see and go from there. 1. The design of snapshots is such that ALL blocks exist in ALL snapshots. That is a basic design element that won't / can't be changed. The concept that an FX block is not meant to be in a snapshot is not supported. 2. When an FX block is added to a preset the default behaviour should be that it is on. The assumption is correctly being made that you want to use the block. Else, why add it? As phil_m says, current behaviour is as designed and is not a bug. Ideascale is the place to argue for different design behaviour. But as PeterHamm says, it takes a few seconds to visit all snapshots and turn the FX on/off in each as desired. So I wouldn't expect to see the idea adopted anytime soon. Just when the whole world and his brother are singing the praises of the fantastic SnapShot feature and Cali amps, etc. I come along to rain on the parade! FYI - Thought that you should be made aware that, regarding your latest and greatest Firmware update, and the claimed "active sensing" bug fix. NO IT IS NOT FIXED! â€‹See attached image from midi monitor (Helix Test 07-07-16.tiff) - it's full of active sense messages every 300ms, and they only go away if MIDI Thru is switched off. This makes it impossible to have my controller keyboard pass thru Helix and into Logic. Which is kinda strange as it did when I first bought it in November last year, right until it decided to stop functioning in March this year. It's O.K. I worked around the basic problem by removing Helix from the equation. A $3.50 Chinese MIDI to USB cable simply does the job that this expensive black box cannot! This has started to become really annoying now, as my "escalated" CS ticket informed me, over a month ago (30th May), that a real fix would be in the new Firmware! You see, to some users, it's the little things that matter. Oh yeah, on the bright side - the ability to re-amp Helix has mysteriously healed itself and now works as it should. Odd that, because no one told me there was gonna be a fix for that! A nice little extra, so I will thank you for that. Attachment removed to free up space! Correct me if I'm remembering this incorrectly, but you had a Roland keyboard that wouldn't reliably trigger soft synths through Helix, right? The fix isn't that Helix strips out active sensing (actually, MIDI devices aren't supposed to do that unless it's a dedicated MOTU-level MIDI interface or MIDI filter/patchbay); it's that active sensing should no longer affect transmission of other MIDI data. Have you tried playing the keyboard? IIRC, we experienced the exact same issue you did with one of our engineer's M-Audio keyboard (which also constantly spits out active sensing), fixed the issue, and it worked fine. It's not completely unheard of that a bug could possibly find its way back into a later build, but your computer will see active sensing data regardless. EDIT: Igor just tested this again, and it's working fine with his M-Audio keyboard, along with buttloads of active sensing data. So the bug was indeed fixed. If you're still getting MIDI note dropouts, something else is going on. I have a Roland V-Synth in storage I can bust out if necessary. NOTE: If you select a snapshot that hasnâ€™t yet been altered, it appears the same as the snapshot you came from. As soon as you alter a new snapshot (say, by enabling or bypassing an amp or effect block), the snapshot becomes "active" and remembers any changes. The point of this behavior is that if you edit a snapshot and like the way it sounds, switching to a different, unused snapshot gives you the exact same sound so you can quickly create a variation of it. Why should I care about snapshots? â€¢ Hey self, when performing live, does the small gap when switching tones drive me nuts? â€¢ If my delay repeats and reverb trails donâ€™t seamlessly spill over when switching tones, does it drive me nuts? â€¢ Do I secretly wish I were an octopus, so I can constantly change amp and effects settings throughout a song? If you answered â€œMâ€™ehâ€ or â€œHuh?,â€ stop reading this now, go play guitar, completely ignore the camera icon, and youâ€™ll never have to worry about snapshots again. Seriously. When I first got the Helix there was no editor and I easily mastered the ability to use the Helix on board controls. When the editor came out I thought I'd not need it; but of course I discovered that using both the manual controls for creation and the editor for modifying, copying & pasting, and other cool abilities they provided together sold me. Point is that I will be updating as well as anticipating all the cool positive features I have read about and seen in action via members video posts. And then in a week I'll be the one who says "How did I live without all these new features and improvements?" to include the snapshot feature. For me what is real cool is that I came into the Helix world and have been growing with the unit and the updates. What I have learned so far is amazing and making my musical life very expansive. Maybe my real fear is that I have created presets that actually can be used for whole if not two whole sets without changing. My DSPs are so maxed that I can't even add a gain block. However, I have many revision folders for the same sets of presets and I believe I may split my most useful into two presets each just in case the one massive preset doesn't load. Not sure if this is normal or not but i cannot save different Instant Commands for each snapshot for the Ext Amp Command. I want to have snapshot one be the clean channel on my tube amp head, snapshot 2 the mid gain channel, and snapshot 3 be the lead channel on my amp. I cannot do this as every time i change the value in one snapshot it changes for all snapshots. As a workaround i can assign footswitches and save their state for each snapshot but i would rather use those footswitches for effects blocks. Is there a setting somewhere i am missing or is this not possible? Let me add that i am able to add different instant commands per snapshot for program changes without an issue but not external amp control. According to the manual saving Ext Amp control can be set per snapshot using the command center. It is not working for me. The strange thing is it worked when I first updated to 2.0 but the next day when I went to play it didn't work and still doesn't work. I tried reinstalling 2.0 and it is still not working. You have to have the Ext Amp jacks assigned to a footswitch in order to change them with a snapshot change. Thanks for the answer. Too bad it couldn't be assigned to the instant commands and keep the foot switches open for something else. Thanks again for the quick response, this was driving me crazy. After downloading 2.0, I'm receiving this "Helix has stopped working" error every time I open the editor. I've uninstalled and reinstalled all Helix applications per the exact instructions and am still having the same issue. Thanks for your time and help! Assuming you have done the global reset already after doing the firmware upgrade (make sure you have your presets backed up), try switching to a factory preset before you plug in the USB connection for the Helix. Make any minor change to the preset that was in use when you were getting the "Helix has stopped working" error and save the change. Now connect the USB and bring up the editor and see if having that preset up when connecting still causes a crash. Good luck! Last night it worked long enough to save my settings. I don't have a clue why. After 4 updates I have run into and isolated an issue. If I load in my saved presets and hit one that I haven't either created or adjusted and saved,(ie anything downloaded from customtone, purchased etc.saved and unedited ) it locks up on that patch. I re updated and have only factory presets and it is works great. I loaded in one setlist and saved my created patches over the downloaded unedited patches, it works great. The minute I hit one of those unedited downloaded patches my Helix freezes and I reboot...hit any button it freezes again so I have to start over with an update. Immediately after each update, did you hold down knobs 9&10 (or 5&6 on the Rack) while restarting the Helix device? This is a requirement, not optional, in firmware 2.0. I have done this step after each of the 4 updates. I did manage to load a setlist and then save my own patches OVER the downloaded unedited/purchased patches and my Helix worked fine. I have generally found that changing any parameter slightly and resaving prevents the preset causing the problem from ever causing a lockup again. You must change something in the preset though. Mileage may differ but I have generally found this to work. I'll try that again. So far When I open one of the patches that causes the issue, the unit freezes before I can adjust anything. I've nothing to lose except the few minutes it takes to re update. Make sure the Helix is offline and you are not connected via USB before you edit the problem patch, otherwise it can freeze the second the editor connects. FYI - I had a similar issue when I updated two firmwares ago. I now follow the instructions about FS9 & FS10 even after the update is supposed to do it automatically; AND in addition after I load my presets and IRs I turn off the Helix (I have the floor model) and use the FS combo to bring all presets into the current version which for me is FS10 & FS11.